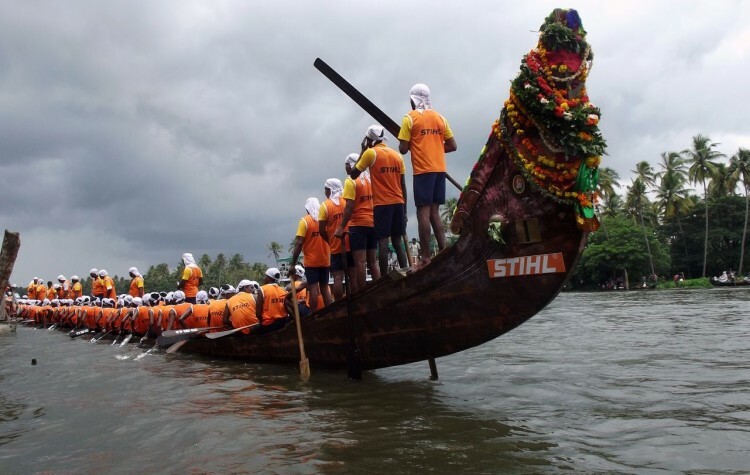 Kerala embodying its pseudonym of God’s Own Country is home to several colourful festivals that are an inherent part of its rich cultural heritage. Spread out across the year the rejoicing and festivities continue for several days. 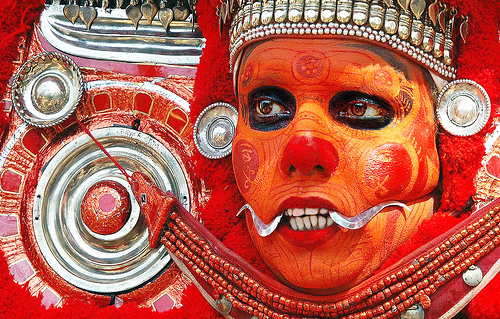 Next time you’re thinking of heading towards Kerala, try and align your holidays with at least one of these magical festivals, trust us, it will be worth it. One of the most important festivals of Kerala, Onam, is also known as the harvest festival. Onam marks the homecoming of the mythical king Mahabali whom the people of Kerala consider their king. 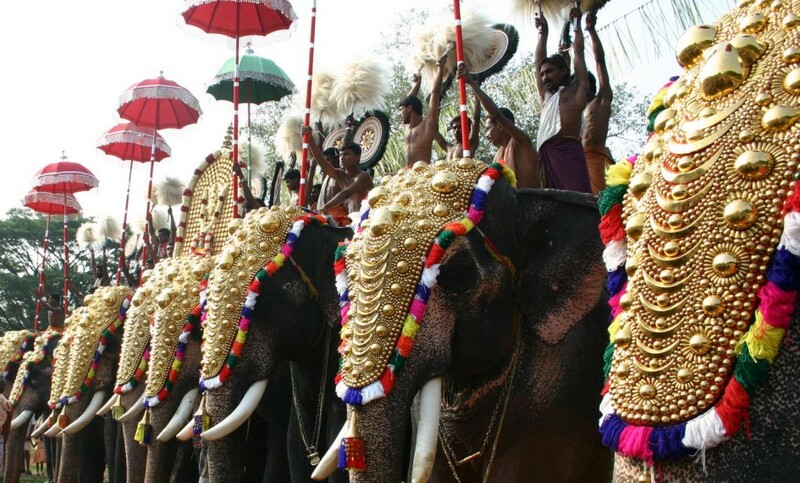 The festival is flagged off with a Royal Parade that starts in a suburb of Kochi and consists of over 50 floats. Floral carpets, sumptuous feasts, the snake boat race and the beautiful Kaikottikali dance are all an inherent part of the festivities. Known as the New Year Festival this festival marks the beginning of the Malayali New Year. 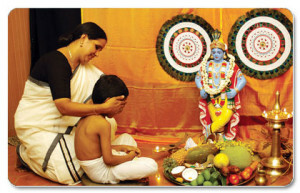 The Vishukanni which literally means “the first thing seen on the day of Vishu” is central to the festival. The Vishukanni usually consists of a traditional arrangement of auspicious things as well as items that signify prosperity like rice, fruits, vegetables, linen, cucumber, betel leaves and coins in a bell metal vessel called uruli. This arrangement is usually made in the prayer room by the women of the house a night before the Vishu Festival. The tradition is to wake up with one’s eyes closed so that the first thing that is seen is the Vishukanni which is usually distributed amongst the less fortunate later on in the day. Unlike other festivals on this list, this one is best experienced if you either have a Malayali friend or are lucky enough to be invited into the home of a local family. 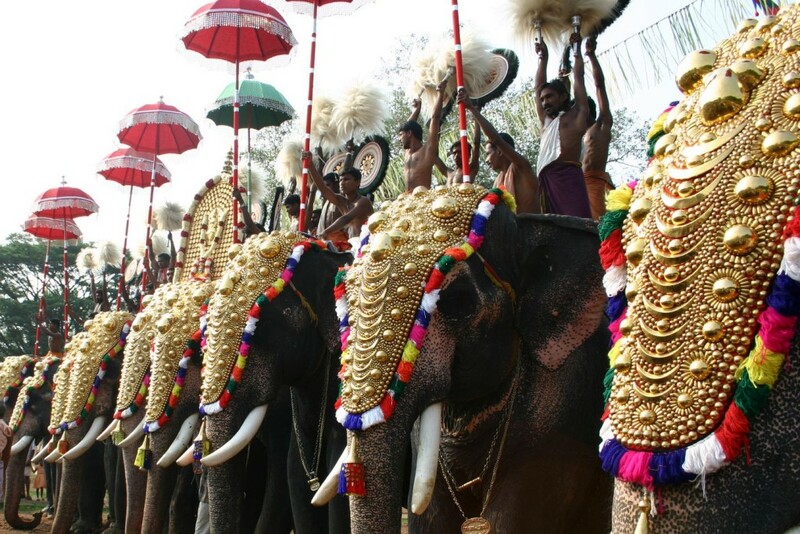 Pooram means “the meeting point of all arts” and therefore this festival showcases the art and culture of Kerala at its best. The splendidly decorated elephants and the dazzling fireworks are the main attractions of this festival. 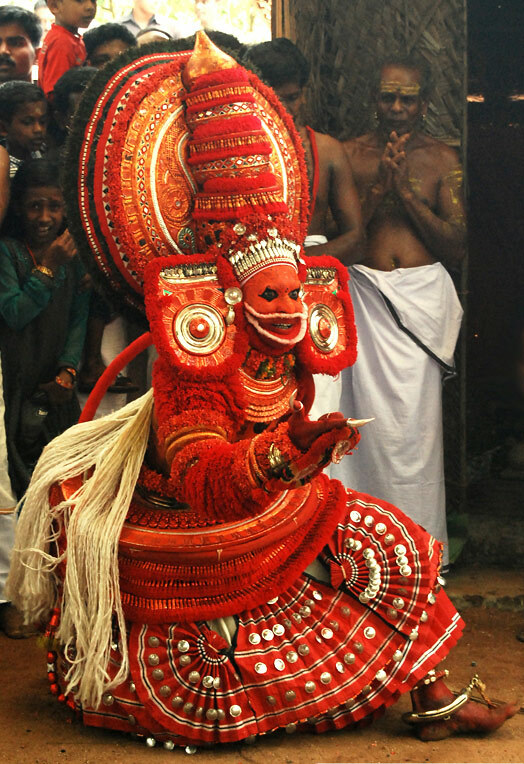 Literally translated Theyyam means God’s dance. 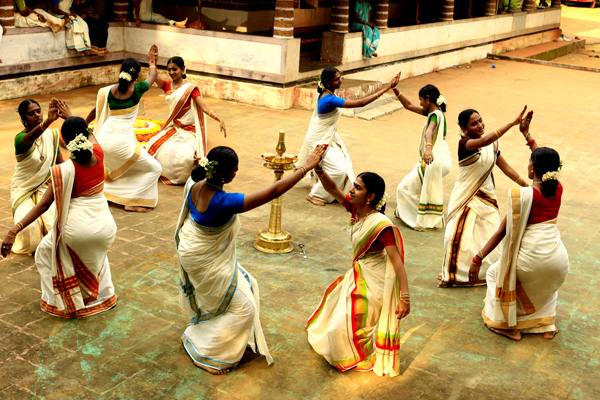 The dances are a ritualistic tradition that is attributed to the communities of North Kerala. 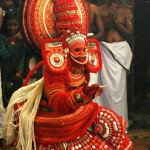 Theyyam worships ancient heroes and ancestral spirits and is usually performed before the local shrine in the village. The spirituality, the religious fervor and the excitement buzzing through the crowd is palpable and definitely worth being witnessed. It is believed that this sacred dance is essential for the safety and well being of the entire family as well as the village. This festival is essentially a festival for women where they pray to Lord Shiva. Unmarried women fast on the day to be blessed with a kind and loving husband whereas married women fast for the well being of their partners. The fast usually involves not eating any rice based food and therefore a special meal is cooked on the days of the festival. Thiruvathira Kali is a dance form that is traditionally performed by women during this festival and the dance is accompanied by folk songs that talk of a lovelorn Parvati’s her longing for her husband Shiva. This incredible festival is held at the Poruvazhi Malanada Temple which is also known for its slightly unique tradition of praying to Duryodhana, a not-so-popular antagonist from the Mahabharata. 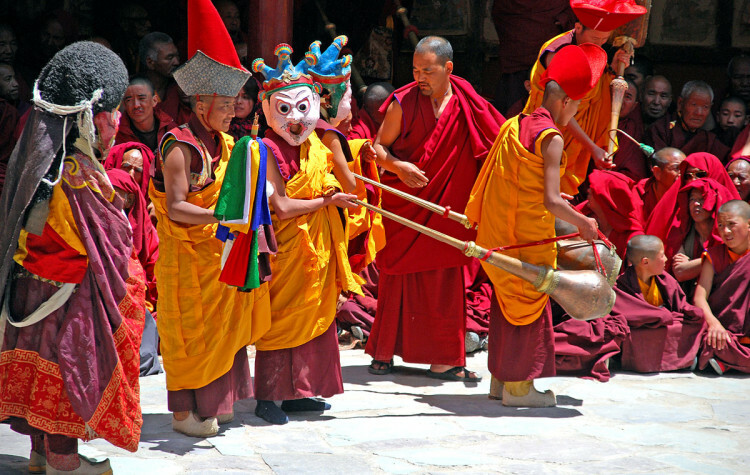 The procession during the Malanada Kettukazcha is a captivating sight which you’ll never forget. Several massive decorated structures up to almost 80 ft tall are paraded around the village (either in chariots or carried over the shoulders of volunteers) and accompanying them is a traditional orchestra of drums. The sound of the drums which is played by the musicians in an almost trance like state is one that you’ll be dancing to in your memories long after you’ve returned from your holiday. 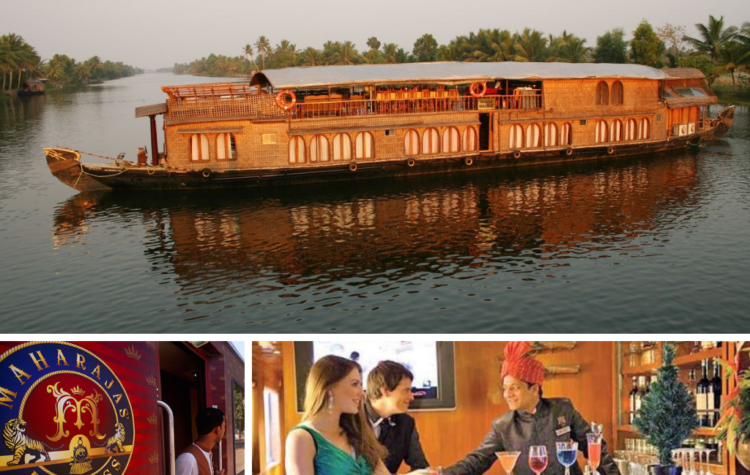 All dates are based on the Malayam Calendar and change annually. If you’re planning to attend a particular festival check the updates dates on the Kerala Tourism Website.